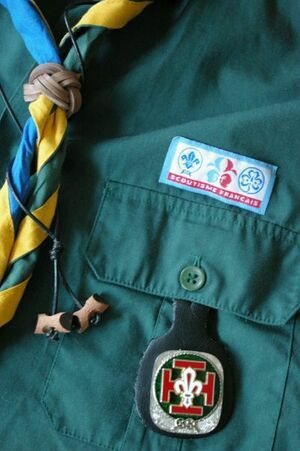 Scouts et Guides de France (Scouts and Guides of France, SGdF) is the largest Scouting and Guiding association in France. It was formed on 1 September 2004 from the merger of two Roman Catholic Scouting organizations: the Guides de France (founded in 1923) and the Scouts de France (SdF, founded 25 July 1920). Through Scoutisme Français, SGdF is a member of both WOSM and WAGGGS. SGdF claims 62,000 youth members and 14,000 volunteers in 924 local groups. It is active in the rebirth of Scouting in Ukraine and Belarus and strengthening Scouting in French Polynesia. The National Centre of the association is at Chateau de Jambville which is 50 km northwest of Paris. The Scout Motto is Toujours Prêt, Always Prepared in French. Sur mon honneur, et avec la grâce de Dieu, je m'engage a servir de mon mieux, Dieu, l'Église et la patrie, à aider mon prochain en toutes circonstances et à observer la loi scoute. On my honor and with the grace of God, I promise to do my best to serve God, the Church and my country, help my neighbour in any circumstance and to observe the Scout's Law. The Scout must strive to be trustworthy. The Scout is loyal to his country, his parents, his leaders and his subordinates. The Scout must serve and save his neighbour. Le scout est l'ami de tous et l'ami de tout autre Scout. The Scout is a friend of everybody and all other Scouts. The Scout is polite and chivalrous. Le scout voit dans la nature l'oeuvre de Dieu, il aime les plantes et les animaux. The Scout sees God's work in nature. He loves plants and animals. The Scout obeys without replying and does nothing by halves. The Scout is his own master, smiling and singing during hardships. Le scout est économe et prend soin du bien d'autrui. The scout is sparing and takes care of what is others. The Scout must be pure in his thoughts, words and actions. Le scout tient parole. En patrouille, je m’affirme et je fais des choix. The scout keeps his word. In my patrol, I stand my ground and I make decisions. Le scout développe ses talents. En patrouille, j’invente et j’explore. The Scout develops his talents. In my patrol, I invent and I explore. Le scout a l’esprit d’équipe. En patrouille, j’accueille et je rends service. The Scout has team spirit. In my patrol, I accept everybody and I serve. Le scout prend soin de son corps. En patrouille, je me dépasse. The Scout takes care for his body. In my patrol, I surpass myself. Dieu propose au scout, un chemin. En patrouille, je découvre en Jésus un ami. God proposes a way to the Scout. In my patrol, I discover a friend in Jesus. Le scout respecte l’autre. Fille ou garçon, j’exprime mes sentiments. The Scout respects other people. Girl or boy, I express my feelings. The red Jerusalem Cross with the fleur-de-lis was the symbol of the Scouts de France. It designed by Father Jacques Sévin SJ, co-founder of the Fédération des Scouts de France. The Guides de France used the same Jerusalem Cross with a superimposed trefoil. The emblem of the merged organization combines elements of both predecessors. The round orange background recalls the rope circle, which symbolizes the strength of the Movement. ↑ "Rapport d’activités 2006" (PDF). Scouts et Guides de France. Archived from the original on 2007-10-15. http://web.archive.org/web/20071015142450/http://www.scoutsetguides.fr/IMG/pdf_rap-dac.pdf. Retrieved 2007-11-10. This page was last edited on 7 November 2015, at 11:35.